A decrease in the overall rate of Tuberculosis (TB) has been reported in the countries of the European Union and the European Economic Area in the last 15 years. However, the number of cases among immigrant populations, particularly those from high-TB prevalence countries, has been gradually increasing, thereby contributing significantly to maintaining the burden of disease [1European Centre for Disease Prevention and Control/WHO Regional Office for Europe. Tuberculosis surveillance in Europe 2018. http://ecdc.europa.eu/sites/portal/files/documents/ecdc-tuberculosis-surveillance-monitoring-Europe-2018-rev1.pdf [Accessed January 27, 2019]]. In some countries such as the UK, Sweden and the Netherlands, cases among immigrants account for over 50% of all TB cases [2Hollo V, Kotila SM, Ködmön C, Zucs P, van der Werf MJ. The effect of migration within the European Union/European Economic Area on the distribution of tuberculosis, 2007 to 2013. Euro Surveill 2016; 21(12)[http://dx.doi.org/10.2807/1560-7917.ES.2016.21.12.30171] [PMID: 27035746] ]. Furthermore, the new immigration wave occurring in Europe suggests this trend may continue to grow in the coming years. It is paramount to ascertain whether new cases of TB among immigrants are due to reactivation of a Latent TB Infection (LTBI) acquired in their country of origin or to disease acquired after their arrival in a new country to establish TB control strategies. Clinical evidence suggests that a significant rate of TB among immigrants developed from an infection acquired in their country of origin [3Borrell S, Español M, Orcau A, et al. Tuberculosis transmission patterns among Spanish-born and foreign-born populations in the city of Barcelona. Clin Microbiol Infect 2010; 16(6): 568-74. [http://dx.doi.org/10.1111/j.1469-0691.2009.02886.x] [PMID: 1968 1961] , 4Sandgren A, Schepisi MS, Sotgiu G, et al. Tuberculosis transmission between foreign- and native-born populations in the EU/EEA: A systematic review. Eur Respir J 2014; 43(4): 1159-71. [http://dx.doi.org/10.1183/09031936.00117213] [PMID: 24114966] ]. The fact that the country of origin can accurately predict the number of cases that will arise later together with the number of cases from which an immigrant could be identified as at risk, are additional challenges [5Kon OM. Time for a preventative strategy for TB in the UK: further evidence for new entrant screening in primary care. Thorax 2014; 69(4): 305-6. [http://dx.doi.org/10.1136/thoraxjnl-2013-204777] [PMID: 24385321] ]. There is a long-standing demand to develop strategies for the early detection of TB and LTBI among immigrants from countries with a high-TB prevalence to prevent progression of the disease [6Zammarchi L, Casadei G, Strohmeyer M, et al. A scoping review of cost-effectiveness of screening and treatment for latent tubercolosis infection in migrants from high-incidence countries. BMC Health Serv Res 2015; 15: 412. [http://dx.doi.org/10.1186/s12913-015-1045-3] [PMID: 26399233] ]. Primary health care has been identified as key in controlling TB among immigrants [7Panchal RK, Browne I, Monk P, Woltmann G, Haldar P. The effectiveness of primary care based risk stratification for targeted latent tuberculosis infection screening in recent immigrants to the UK: A retrospective cohort study. Thorax 2014; 69(4): 354-62. [http://dx.doi.org/10.1136/thoraxjnl-2013-203805] [PMID: 24253833] ]; however, clinical evidence showed that TB screening is not routinely performed in this setting [8Stagg HR, Jones J, Bickler G, Abubakar I. Poor uptake of primary healthcare registration among recent entrants to the UK: a retrospective cohort study. 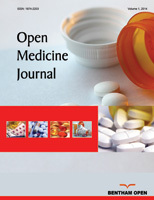 BMJ Open 2012; 2(4): e001453. [http://dx.doi.org/10.1136/bmjopen-2012-001453] [PMID: 22869094] ] nor will it usually follow the national guidelines [9Pareek M, Abubakar I, White PJ, Garnett GP, Lalvani A. U.K. immigrant screening is inversely related to regional tuberculosis burden. Thorax 2011; 66(11): 1010. [http://dx.doi.org/10.1136/thx.2010.152280] [PMID: 21325664] ]. In Spain, it is recommended that all immigrants be given a health card and be medically screened at first contact with the health system [10Grupo de Trabajo de los Talleres de 2001 y 2002 de la Unidad de Investigación en Tuberculosis de Barcelona. [Prevention and control of imported tuberculosis]. Med Clin (Barc) 2003; 121(14): 549-57. [http://dx.doi.org/10.1157/13053401] [PMID: 14599411] ]. Following this recommendation, a TB screening programme was launched at a primary health centre for immigrants from high-prevalence countries. The programme attempted not only to detect TB cases but also LTBI, which is considered crucial to prevent progression of the disease [11World Health Organization. The End TB Strategy Global strategy and targets for tuberculosis prevention, care and control after 2015 http://www.who.int/tb/strategy/en/ [Accessed November 2, 2018]]. The aim of the present descriptive study was to explore this TB screening programme at a primary health centre. The programme was aimed at immigrants from countries most affected by TB (incidence > 100/100,000) and established with the Public Health Agency of Barcelona, according to the Guidelines for the Prevention and Control of Tuberculosis in Barcelona and the WHO recommendations [12 Guia Proposta d’organització per a la Prevenció i Control de la Tuberculosi a l’àrea de la Regió Sanitària de Barcelona. http://www.gencat.cat/salut/botss/pdf/guia_tuberculos_def.pdf [Accessed November 3, 2018], 13 Directrices sobre la atención a la infección tuberculosa latente. OMS. ISBN: 978 92 4 354890 6 Número de referencia OMS: WHO /HTM/TB/2015.01.]. The study protocol was approved by the local Ethics Committee and all participants were individually assessed according to their cultural and social background to ensure equity among participants and signed their informed consent [14Guidance on ethics of tuberculosis prevention, care and control 2010.]. The programme was carried out from March 2009 to March 2012 at the primary health centre of Barceloneta. This area covers Ciutat Vella, the inner-city district of Barcelona with a population of around 15,000 inhabitants with a high ageing population and many reduced-space homes (around 40 m2). Approximately 5,500 of the population in this district was born abroad, a higher rate than the city average according to the 2014 municipal census [15Ajuntament de Barcelona. Departament d’Estadística Lectura del padró municipal d'habitants a 30062014 http://www. bcn. cat / estadistica / catala/dades/barris/tpob/pad/padro/a2014/cp11.htm [Accessed November 3, 2018]]. The study protocol for TB screening in the immigrant population treated at the Barceloneta primary health centre is shown in Fig. (1 ). When there was a language barrier, the centre had an interpreter available. Briefly, at the time of their first registration in the health centre, immigrants from risk countries were invited to join the TB detection programme. Booklets with information in different languages were available, and participants gave their written informed consent, after which they were promptly directed to a reference nurse (5-15 minutes) who conducted a survey regarding epidemiological, clinical and demographic data such as previous diseases, alcohol abuse (yes/no), smoking (yes/no), other toxic habits (heroin, cocaine, cannabis and benzodiazepine consumption), financial vulnerability according to the need for social resources (yes/no), precarious employment (yes/no) and previous TB or therapy for LTBI. BCG vaccination status was not considered. Next, the nurse performed the Tuberculin Skin Test (TST) using 2 units of PPD-RT 23 with Tween 80, made an appointment for test reading three days later and requested a chest X-ray at the radiology department of the Hospital del Mar (located next to the primary care centre). This form identified the subject as a participant in the programme, and that he/she underwent a chest X-ray shortly after arrival (usually between 10 and 60 minutes). All chest X-rays were reported by specialists and sent to the referring GP. Study flow diagram of the 129 immigrants included in the tuberculosis screening programme. ; TST = tuberculin skin test. For asymptomatic subjects with a normal chest X-ray and positive TST, or radiological pattern suggestive of TB with negative/not performed TST, Quantiferon TB Gold in Tube [16Diel R, Goletti D, Ferrara G, et al. Interferon-γ release assays for the diagnosis of latent Mycobacterium tuberculosis infection: A systematic review and meta-analysis. Eur Respir J 2011; 37(1): 88-99. [http://dx.doi.org/10.1183/09031936.00115110] [PMID: 21030451] ] was performed. This Interferon-Gamma Release Assay (IGRA) has been approved for the in vitro quantification of the cellular immune response using antigens specific to Mycobacterium tuberculosis. In the same blood test, routine biochemical analyses, serologies for Human Immunodeficiency Virus Infection (HIV) and hepatitis virus were determined. TST was read in 83 of the 129 participants (64.3%): 51 were negative (61.6%) and 32 positive (38.6%). Of the remaining 46 cases, 12 failed to return for test reading and 34 did not attend the TST (Fig. 2 ). Chest X-ray was indicated in 123 participants and taken in 91 (74%) and was not indicated in 6 cases (5 teenagers and 1 possible pregnancy) (Fig. 2 ). The 32 participants, who did not have the chest X-ray indicated according to the protocol, did not attend the radiology clinic to have this performed. Of the 91 chest X-rays performed, radiological lesions consistent with TB were observed in three cases, while seven chest X-rays revealed old fibrotic TB lesions (Fig. 2 ); a further seven chest-X-rays demonstrated other non-TB radiological changes including azygos lobe, pericardial effusion and Poland syndrome. Population mobility across the world is rapidly becoming a key determinant of infectious disease epidemiology. The relationship between migration and TB control has been extensively addressed [17Riley S. Large-scale spatial-transmission models of infectious disease. Science 2007; 316(5829): 1298-301. [http://dx.doi.org/10.1126/science.1134695] [PMID: 17540894] ]. Immigrants have an increased risk for TB, depending on the TB incidence in their country of origin, conditions of their migration and duration of stay in the host country. In Spain, according to the National Epidemiological Surveillance Network [18Cano-Portero R, Amillategui-Dos Santos R, Boix-Martínez R, Larrauri-Cámara A. Epidemiology of tuberculosis in Spain. Results obtained by the National Epidemiological Surveillance Network in 2015. Enferm Infecc Microbiol Clin 2018; 36(3): 179-86. [http://dx.doi.org/10.1016/j.eimc.2017.11.013] [PMID: 29326000] ], the incidence of TB in 2015 was 10.59 cases per 100,000 inhabitants, with the percentage of subjects born in other countries being approximately 30% of the total. We must take into account that this percentage varied greatly among the different autonomous communities, with Catalonia and Madrid having the highest percentages (37 and 20%, respectively). In the present study, of 129 immigrants from high-TB prevalence countries who entered the programme at a primary care centre, 3 (2.3%) new cases of TB and 29 (30.5%) of LTBI were detected. These results are close to those published in a systematic review and meta-analysis to determine the performance of screening in detecting active TB at the point of entry [19Arshad S, Bavan L, Gajari K, Paget SN, Baussano I. Active screening at entry for tuberculosis among new immigrants: A systematic review and meta-analysis. Eur Respir J 2010; 35(6): 1336-45. [http://dx.doi.org/10.1183/09031936.00054709] [PMID: 19840970] ] and provide useful data for the development of rational services for active detection of TB in immigrants, especially at primary health centres. Therefore, these findings support the fact that in low-TB incidence countries, systematic screening of immigrants at high risk for TB may be considered a key intervention in progress towards TB elimination [20Aldridge RW, Zenner D, White PJ, et al. Prevalence of and risk factors for active tuberculosis in migrants screened before entry to the UK: a population-based cross-sectional study. Lancet Infect Dis 2016; 16(8): 962-70. [http://dx.doi.org/10.1016/S1473-3099(16)00072-4] [PMID: 2701 3215] ]. 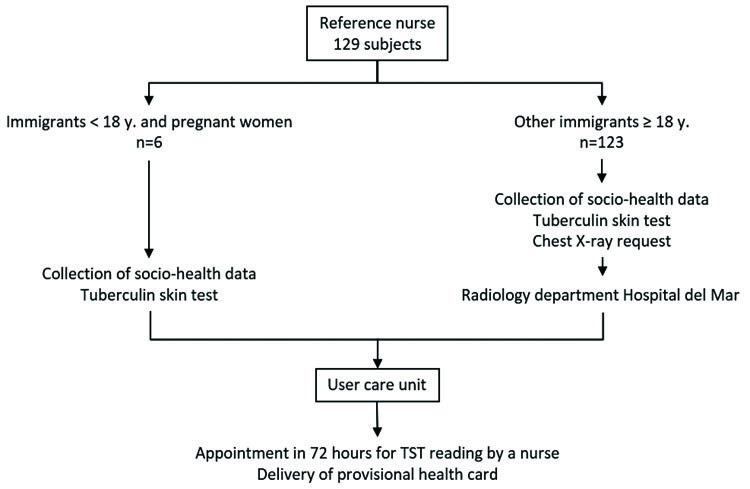 Results of tuberculin skin test, chest X-ray and IGRA in the 129 immigrants. *32 TST (+) plus 2 without TST but with abnormal chest X-ray NP = not performed; NR = not read; TST = tuberculin skin test. Epidemiological and clinical characteristics of the 129 immigrants included in the study. Times for screening for infectious diseases vary from country to country: either prior to arrival, on arrival or later [21Kärki T, Napoli C, Riccardo F, et al. Screening for infectious diseases among newly arrived migrants in EU/EEA countries varying practices but consensus on the utility of screening. Int J Environ Res Public Health 2014; 11(10): 11004-14. [http://dx.doi.org/10.3390/ijerph111011004] [PMID: 25337945] ]. Detection strategies for newcomers at the time of arrival have been successful in countries such as the United States [22Bibbins-Domingo K, Grossman DC, Curry SJ, et al. Screening for Latent Tuberculosis Infection in Adults: US Preventive Services Task Force Recommendation Statement. JAMA 2016; 316(9): 962-9. [http://dx.doi.org/10.1001/jama.2016.11046] [PMID: 27599331] ], with a significant reduction in the number of TB cases [23Baker BJ, Winston CA, Liu Y, France AM, Cain KP. Abrupt decline in tuberculosis among foreign-born persons in the United States. PLoS One 2016; 11(2): e0147353. [http://dx.doi.org/10.1371/journal.pone.0147353] [PMID: 26863004] ]. However, there have been few reports on TB screening in the primary health care setting. It is therefore difficult to compare the present results with reports from other similar settings. Several studies have demonstrated that the costs of the early detection of TB and LTBI outweigh those of subsequent TB treatment [24Haukaas FS, Arnesen TM, Winje BA, Aas E. Immigrant screening for latent tuberculosis in Norway: A cost-effectiveness analysis. Eur J Health Econ 2017; 18(4): 405-15. [http://dx.doi.org/10.1007/s10198-016-0779-0] [PMID: 26970772] ]. This supports the need for new strategies designed to increase access to TB screening, particularly for high-risk populations such as immigrant communities. The programme demonstrated a remarkable fulfillment rate compared with other experiences in detecting TB in immigrants [25Pareek M, Abubakar I, White PJ, Garnett GP, Lalvani A. Tuberculosis screening of migrants to low-burden nations: Insights from evaluation of UK practice. Eur Respir J 2011; 37(5): 1175-82. [http://dx.doi.org/10.1183/09031936.00105810] [PMID: 21071474] ]. The presence of responsible staff in all areas involved in the programme, very clear algorithms, and prompt completion of tests may explain this high participation. Furthermore, the proximity of the primary care centre and hospital radiology department could explain the high rate of chest X-rays performed in the present study, slightly higher than the TST. Nevertheless, 34 patients did not have a chest X-ray. The distribution of TB cases and LTBI by country was similar to that reported in 2014 in relation to the detection of TB prior to entry into the United Kingdom by the National Health Service [26UK pre-entry tuberculosis screening report 2014 Public Health England https://www.gov.uk/government/uploads/system/uploads/attachment_data/file/442201/UK_pre-entry_tuberculosis_screening_report_2014_gateway_approved.pdf [Accessed November 3, 2018]]. Therefore, these programmes make sense, particularly in countries where no screening is performed on arrival. In the present study, the detection of 29 (30.5%) LTBI cases is highly relevant, since 5-10% of these cases will develop active TB, and the risk rises substantially in smokers (2.5 times) and those with HIV infection (10 times) [27Getahun H, Matteelli A, Chaisson RE, Raviglione M. Latent Mycobacterium tuberculosis infection. N Engl J Med 2015; 372(22): 2127-35. [http://dx.doi.org/10.1056/NEJMra1405427] [PMID: 26017823] ]. The IGRA technique is more specific and, in some studies, more sensitive than TST [28Scholman T, Straub M, Sotgiu G, et al. Superior sensitivity of ex vivo IFN-γ release assays as compared to skin testing in immunocompromised patients. Am J Transplant 2015; 15(10): 2616-24. [http://dx.doi.org/10.1111/ajt.13330] [PMID: 26014909] ]. The combined use of TST and IGRA is already recommended in various guidelines and specifically in healthy individuals who have a low risk of progression to TB [29Mazurek GH, Jereb J, Vernon A, LoBue P, Goldberg S, Castro K. Updated guidelines for using Interferon Gamma Release Assays to detect Mycobacterium tuberculosis infection - United States, 2010. MMWR Recomm Rep 2010; 59(RR-5): 1-25. [PMID: 20577159] ]. 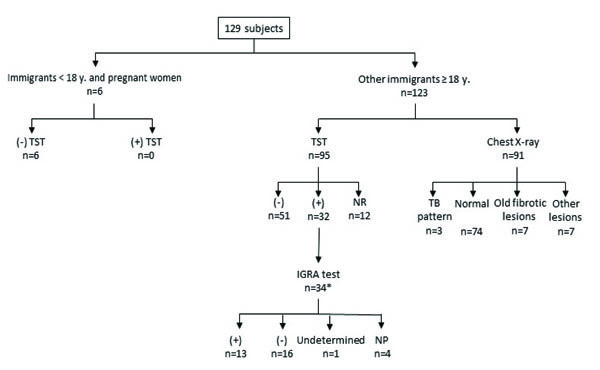 Positivity of the IGRA technique predicts the long-term development of TB compared with positive TST [30Campbell JR, Krot J, Elwood K, Cook V, Marra F. A systematic review on TST and IGRA tests used for diagnosis of LTBI in immigrants. Mol Diagn Ther 2015; 19(1): 9-24. [http://dx.doi.org/10.1007/s40291-014-0125-0] [PMID: 25579159] ]. Thus, considering the use of TST and IGRA techniques together, as in the present study, can be a good strategy for deciding to start therapy for LTBI in this risk group [31Blount RJ, Tran MC, Everett CK, et al. Tuberculosis progression rates in U.S. Immigrants following screening with interferon-gamma release assays. BMC Public Health 2016; 16(1): 875. [http://dx.doi.org/10.1186/s12889-016-3519-6] [PMID: 27558397] ].